From Top to Bottom, we will detail your Motorhome, Travel Trailer or RV to make it look like new again! We take great care in making your vehicle shine. Whether you're getting ready to take off for the season, your next road trip, or just getting home from the last one we got you covered. Let us return your Motorhome, Travel Trailer or RV back to top notch shape! 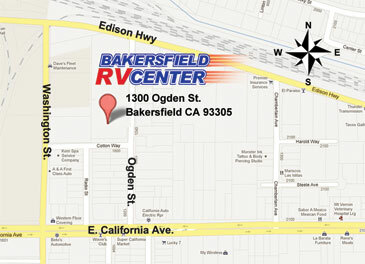 Great pricing and quality work, it's all here at Bakersfield RV Center take a look below for services available, don't see what you want, let us know we are here to accommodate. Vacuum all carpeted areas, including the bedroom,living room, furniture. Sanitize and wipe down all furniture. Cleaning and polishing of all glass surfaces with our streak free formula. All woodwork is thoroughly cleaned, and treated with a lemon oil based formula. Cleaning of all major appliances including refrigerator, microwave, etc. Sanitize bathroom, toilet, shower, sink, etc. Cleaning of dashboard area if applicable. Treatment of all chrome and stainless steel pieces. Treatment of all leather surfaces. Treatment of all vinyl surfaces. Sanitize kitchen area, sinks, counter tops, etc. Spot stain removal on carpets. Wash and scrub exterior of RV. Removal of black streaks, water, and rust spots. Oxidation and tree sap removal. Cleaning and polishing of all glass surfaces. Dressing of all vinyl and rubber surfaces. Cleaning/dressing of rims and tires. Buff exterior with specially formulated compound for RV’s. Buff exterior with specially formulated wax for RV’s.